Cody watches Jeff Burr finish up his Puppet Master two parter. Puppet Master 5 arrived in video stores soon after Puppet Master 4, but it wasn't a rushed production thrown together to get a sequel out quickly, it was actually made at the same time as 4. Not just filmed back-to-back with it; as documented in the Video Zone special features on the films, the shooting schedule for any given day of the production could involve scenes from both 4 and 5. Thus, it's no surprise that 5 begins within hours of the end credits rolling on 4. Science wunderkind Rick Myers (Gordon Currie) has been arrested and charged with murder. Rick had been the caretaker at the Bodega Bay Inn during the off season, using the isolation to help him focus on the work he had been doing for Biotech Industries' Omega Project, the attempt to develop artificially intelligent robots. Rick's research didn't sit well with the demon lord Sutekh, the god from whom the secret to giving inanimate life was stolen and used by Andre Toulon to create his living puppets. 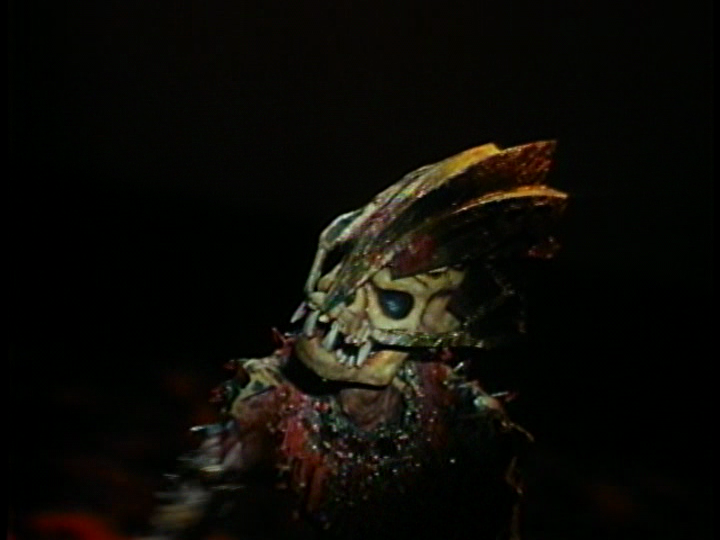 Demonic creatures called Totems, the upworld avatars of Sutekh's underworld-dwelling minions, attacked and killed the scientists working on the Omega Project with Rick, as well as an old rival of his who was visiting the inn. Luckily, Rick discovered the secret of Toulon’s puppets and the puppets themselves on the same night the Totems arrived, and the puppets battled the little demons to the death, destroying all three of them. When a Totem was killed in our world, one of Sutekh's demons dropped dead in their world. Now Rick is catching the blame for all of the deaths. Even though there is security camera footage of his fellow scientists being killed by the Totems, the police assume they were robots created by Rick. Rick does get some support from his girlfriend Susie (Chandra West), who was there at the inn during the Totem attack and saw what happened, and from Doctor Jennings, director of operations at Biotech, played by Ian Ogilvy. After hearing Rick's incredible story about the living puppets, Jennings bails him out… And starts having some ideas of his own. After getting out of jail, Rick heads back to the Bodega Bay Inn to gather up all of Toulon's puppet and take them away to safety. Unbeknownst to him, Jennings is also going to the inn, sneaking in under the cover of night with a trio of dimwitted criminals (Nicholas Guest of Dollman as Tom, Willard Pugh of The Hills Have Eyes Part 2 as Jason, Duane Whitaker of From Dusk Till Dawn 2: Texas Blood Money as Scott) call them "infiltration specialists", with the intention of stealing the puppets for his own purposes. Meanwhile, Sutekh has no minions left and more people in the upworld to kill, so he fuses his own essence to a Totem and sends it to the Bodega Bay Inn as his avatar in our world. "Your life will be my life, your blood will be my blood, your power will be my power!" He may be in tiny form, but the demon god now walks the Earth. 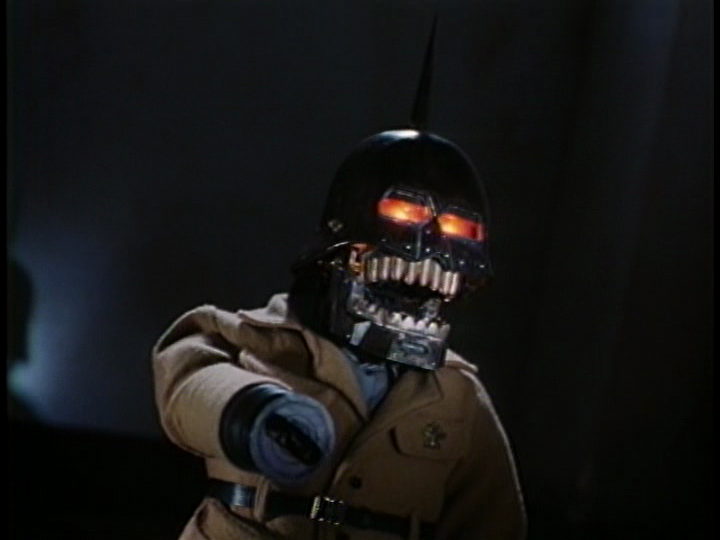 The screenplays for both Puppet Master 4 and 5 were crafted by Steven E. Carr, Jo Duffy, Todd Henschell, Doug Aarniokoski, and Keith Payson, and the problem is that, even though there were so many writers involved, they still didn't manage to come up with quite enough story to fill out the second half of this double feature. The bulk of part 5's running time involves the human characters just wandering around Bodega Bay Inn’s dark hallways… There was so much "wandering the hallways" footage that the editors jokingly referred to Puppet Master 5 as Hallway: The Movie as they were cutting it together. One-by-one, Sutekh's Totem knocks off the more unscrupulous characters, gaining power by absorbing their lifeforces. It's up to the puppets to stop the evil god from continuing his murder spree. There is a subplot about Rick and Susie's friend Lauren (Teresa Hill), a psychic who was driven into catatonia by the previous Totem attack on the inn, having visions of Sutekh and communicating with Rick through his computer while lying in her hospital bed, but it doesn't amount to all that much. 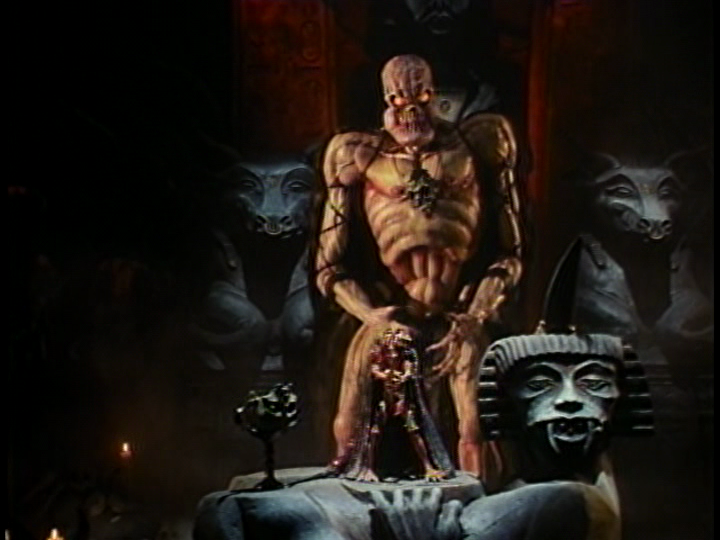 This installment's lack of substance is compounded by the fact that the third act is essentially the same as part 4's was; both concern the complicated resurrection of a more robotic, unfinished puppet of Toulon's called Decapitron, the only puppet strong enough to finish off the Totems, especially this super-powered Sutekh Totem. Although they weren't given much to do, director Jeff Burr managed to assemble a great cast for Puppet Masters 4 and 5. Everyone did well handling what they had to deliver. 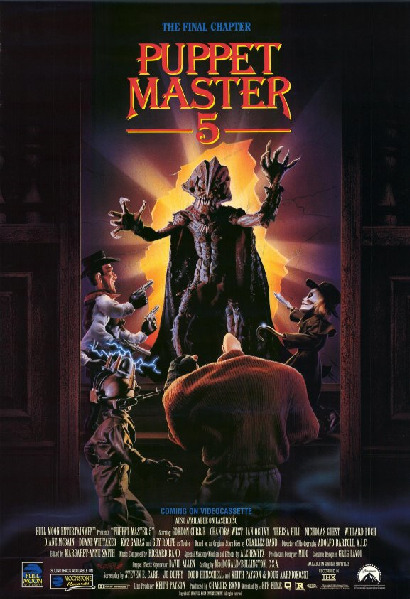 In addition to the actors already mentioned, Puppet Master 5 also includes a welcome cameo by Return of the Living Dead's Clu Gulager, who even manages to call another character "buddy boy" during his brief screen time, a term of endearment he also used in Return of the Living Dead and Nightmare on Elm Street 2: Freddy’s Revenge. Ron O'Neal, best known for his role in the Super Fly movies, also cameos, as the detective who gives Rick a hard time. Of course, the true draw of these films are the puppets themselves, again brought to life through a mixture of rod puppetry, "slave systems", and stop-motion sequences created by Oscar winner David Allen. The puppets have some fun interactions with the human characters, and their brawl with the Totem is awesome, an impressive display of effects artistry. Puppet Master production company Full Moon had the budgets to pull off these things in a fantastic way back in the day. I miss seeing effects on this level in the series. 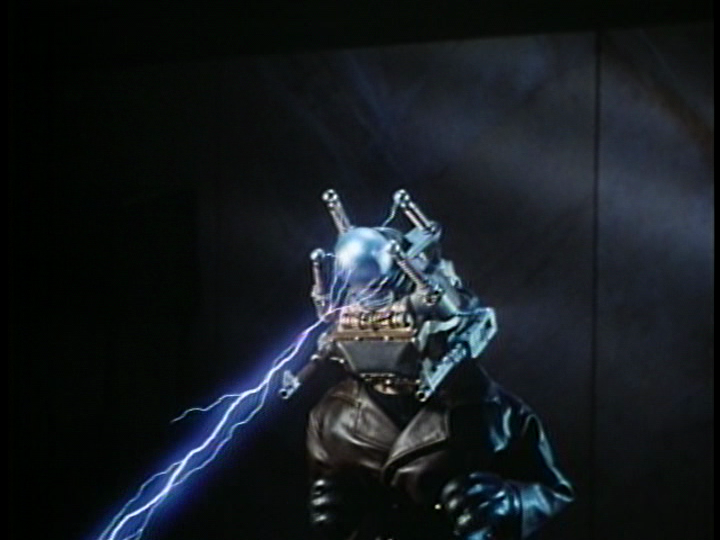 5 even features the return of the puppet Torch, who was introduced in Puppet Master II. Torch is often left out of the films because his flamethrowing ability is deemed too complicated for their budgets. He gets a special moment to shine in this one. Puppet Master 4 is my favorite movie of the franchise. 5 is a rather lackluster follow-up, although one I'm grateful to have. 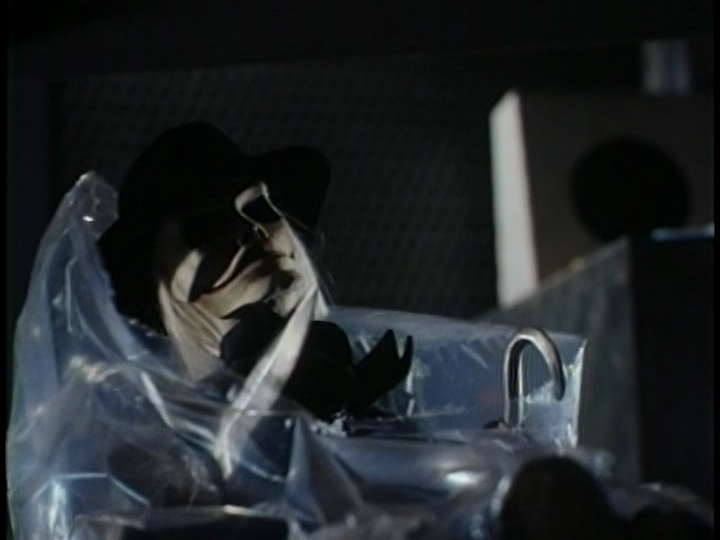 I really wish the story of Rick Myers: Puppet Master, had continued on through further sequels. Puppet Master 5 closes with a voiceover by Rick saying that he knows "there will be more evil to fight. At least I’ll have a few friends to go into battle with me." I want to see those battles! Worth Mentioning - Hey, Beastmaster's On!